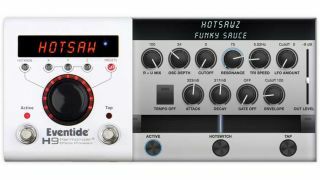 Eventide has announced the HotSawz Synth algorithm for its H9 pedal. The 50th H9 algorithm Eventide has produced, the HotSawz Synth is a new pitch-tracking, monophonic synth engine that features six stackable sawtooth oscillators, three modulation sources and four assignable destinations. The pedal's modulation sources are LFO, Envelope Follower and ADS Gate, while its assignable destinations are Filter Cutoff, Volume, Pitch and Oscillator Depth, resulting in 64 combinations of source-to-designation assignments. According to Eventide, the algorithm is perfect for toying with the sounds of Eighties-inspired scores such as Blade Runner and Stranger Things, as well as imitating the bleeps and bloops of 8-bit videogames. HotSawz is available now via the H9 Control app for iPhone, iPad, Mac, PC and Android for $19.99. It’s free for H9 Max owners. For more info, head on over to eventideaudio.com.